What is Asian Blog Ranking?! “Asian Blog Ranking” is a free smartphone application that allows you to search among over 7,000 different celebrities. Featuring a “Favorites” function and searchable categories, it’s easy to find and read the blog entries and posts of all of your favorite entertainers! Much easier than Internet searches! Register your favorite entertainers and view all of their blog entries and posts in a single list! 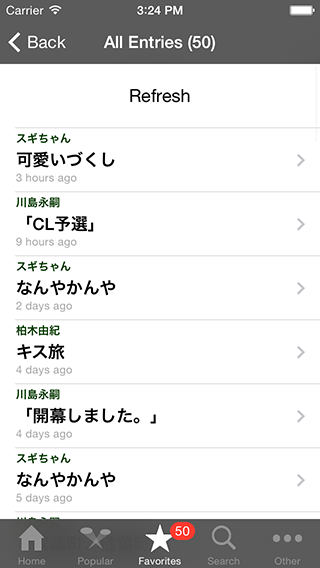 Possible to translate between Korean, Japanese, and English inside the app! New Arrivals, Popular Ranking Search by several categories including Male Celebrities, Women Celebrities, Singers and Musicians, Actors, Actresses, Comedians, Models, Athletes, Cartoonists, Voice Actors, Writers, Novelists, Politicians, Businessmen, Other Celebrities, Announcers, Professionals, Journalist, Artists, Critics, and more! 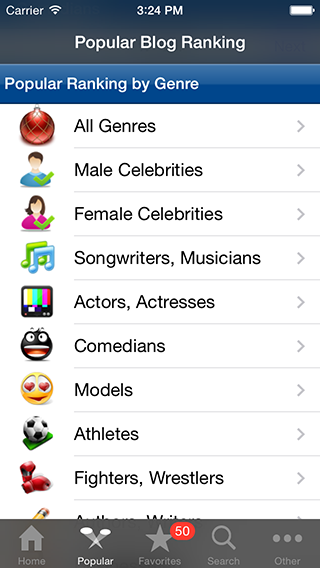 The application introduces you to new celebrities you may be interested in via a New Arrivals and Popular Ranking list! Allow push notifications to receive alerts when new entertainers are added! Birthday and Hometown You can search for celebrities by their birthday and hometown. Do any of your favorite celebrities share the same birthday as you?! Going to every one of your favorite entertainer’s blog site can be a real pain, can’t it? Well, let us recommend the “Favorites” feature of Asian Blog Ranking! After registering your favorite entertainers as a “Favorite” inside the application, you can quickly and easily check for updates on their blog! All of your favorites’ blog entries can also be viewed in a single list, allowing you to quickly check who has updated their blog since the last time you checked! Unread message counts are also tracked, so you can instantly see how many new blog posts there are to read between all of your favorites. 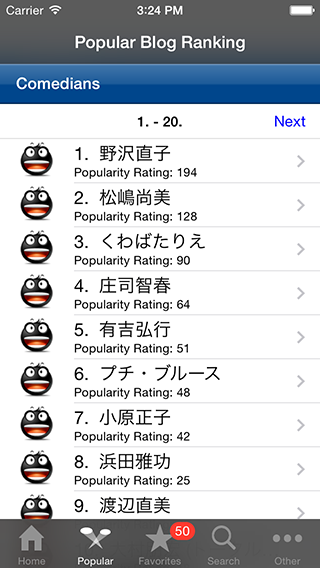 * Popular Ranking is based on the popularity index calculated on Asian Blog Ranking (PC website version). Download “Asian Blog Ranking” now!